It took some convincing, but you finally accepted that you needed hearing aids. Probably caused by years of concerts and loud music, your hearing loss was preventing you from keeping up with conversations and you were struggling at work. You have come to love your hearing aids—you have the hearing you had at 18 and feel fully engaged in the world. However, sometimes there is a problem with the device—no sound comes through or the sound is distorted. 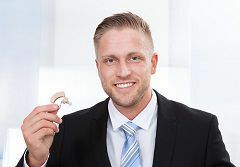 You know the hearing care professionals at Premier Hearing Centers can take care of the problem for you, but you need it fixed now, before your next meeting. Keep the following troubleshooting checklist handy the next time your hearing aid needs a quick fix. While your hearing aid is usually reliable, sometimes you encounter a glitch that becomes an annoyance. There is often a simple solution to many of the common problems you can experience. Check out our guide to simple fixes to annoying problems. Make sure the device is turned on. It may feel like a stupid mistake, but it happens more often than you might think. Also, check that the batteries are installed correctly. Carefully clean away debris. Wax or other material may be blocking the microphone or sound outlet. A cleaning might do the trick. Turn the volume up. Again, a common mistake. Manual volume controls can easily be turned down without you realizing or remembering you did it. Try changing settings or programs. Toggle between memories or programs to see if that helps. Replace the battery. If you have a battery tester, check the battery before you open a new one. Even if you replaced it recently, you may find you need a new one already. Visit your Premier Hearing Center. If none of these steps solves the problem, the device may be damaged. Come in and let us check it out for you. Turn up the volume. It may seem too obvious, but it’s always worth a try! Visually inspect the device. Check the hearing aid for wax blocking the microphone. If you have an earmold and tubing, inspect the tubing for cracks, blockages, or beads of moisture. If you need assistance changing the tubing, visit your Premier Hearing Center. Try a different program or memory setting. A switch may have been accidentally toggled, changing the setting. Click around to see if the volume gets any better. Get your hearing checked. If these fixes don’t work, consider whether your hearing may have changed. Schedule an appointment at your closest Premier Hearing Center for a check-up. Check the batteries for corrosion. If you are getting sound and the volume is acceptable but the sound is distorted, it may be a battery problem. First, inspect the batteries themselves for signs of corrosion. Inspect the battery contacts. Next, check the battery contacts for corrosion. Make sure the contacts are coming in complete contact with the battery. Try a different program or memory setting. This is worth trying with any hearing aid problem. The toggle could be between settings or on the wrong setting, causing distortion. Visit your Premier Hearing Center. If you believe your device is damaged, visit us for an inspection. Remove and reinsert the hearing aid. First try reinserting the hearing aid. If it was inserted improperly, it could be the cause of the feedback. Turn down the volume. If this stops the whistling, you may need to have your hearing aids re-fitted as air may be leaking in around the earmolds. Clean your ears. Your ear canals may be blocked with earwax, causing sound to bounce back out and cause feedback. Schedule a cleaning with your hearing care professional. Of course, we are always here for you at Premier Hearing Centers, so if you’ve tried all of these tips and nothing has worked, schedule a maintenance and repair appointment today. We’ll get you fixed up in no time. Call now at 888-280-7114.